mundane jane: Lost in Austen. On Saturday, I took a break from the rest of the world and spent the majority of the day on the couch. Judge me if you like; I'm old and tired, and I don't care what you think. I took a few naps, but I also watched a couple of movies. The best was ITV's Lost in Austen. Originally broadcast as a four-part television series in the UK last September, it aired on the Ovation Channel here in January. Even so, I had never heard of it before Muffin's recommendation. While I may be the English major, she's the family's resident expert on all things Austen. She handed it to me with the words, "This is adorable." Jemima Rooper stars as Amanda Price, a Jane Austen fan who loves to lose herself in a book--specifically, Pride and Prejudice. She loves the love story and Elizabeth Bennet, but more than that--she craves "the manners and language and the courtesy." One evening, Elizabeth comes through a secret door behind Amanda's bathtub, and the two switch places. Elizabeth disapears into the 21st century, and Amanda finds herself at mannerly Longburn at the beginning of the novel. Try as she might to keep everything going as written, her presence (and her cute-as-pieness) stretches Pride and Prejudice all out of whack. It's all so charmingly done that even the purists won't mind. Rooper is the perfect everyreader, and a good choice if you are to imagine yourself inserted into the plot of a Jane Austen book. She's every bit as lovable as Elizabeth; it's easy understand the effect she has on the various Bennets, Bingleys, and Darcys. The movie takes some liberties with social custom, but if the whole fictionalized-characters-interacting-with-real-while-time-traveling doesn't get in your way, then chances are that those won't either. They didn't bother me a bit. 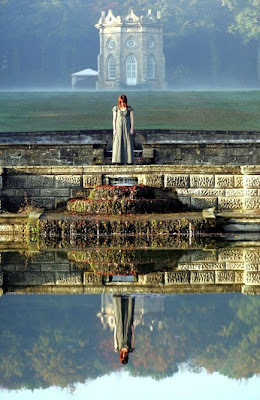 Image, Jane Austen's World, but don't click through if you don't want to see spoilers of the movie. I wonder if Hadley would enjoy this? I wouldn't until you had watched it first. It has some racy bits.